Favorite Chicken & Ribs launch their in-store Christmas promotions this week. Call us old-fashioned but we don’t like to put the tinsel and tree up in October! Featuring two special limited-edition packs that are full of Favorite fans favourites (try saying that after one too many Christmas drinks!). 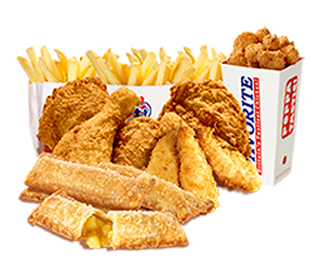 The sharer pack offers Traditional Favorite Chicken along with Chicken Poppas, Crispy Fillet Strips, Favorite Fries and ever-popular Hot Apple Pies. A boneless meal for one follows the theme with a Favorite Breast Fillet replacing the Traditional Chicken and the addition of a Regular Drink or Tub Side.